Spiritual Response Therapist Irenka Danielewicz-Herbert tests a willing soul. You know when you meet someone for the first time, and you just click? Or the opposite, you take an instant dislike to them? It could well be that you knew each other in a previous life, and you have brought with you the emotions, problems or preconceptions you felt back then. Of course, if you don’t believe in reincarnation, (not everyone does), this may not be relevant to you. 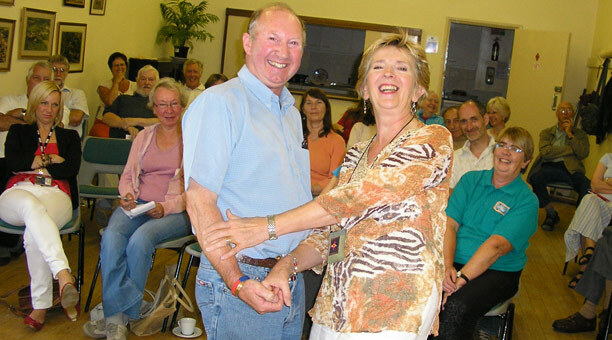 However, if you DO, you should’ve been at our Slimbridge Dowsing Group (SDG) talk by Irenka Danielewicz-Herbert on the subject of Spiritual Response Therapy on 9th July. Irenka explained in her strong Polish accent that we bring with us through many lifetimes, old behaviours, patterns and programming. both good and bad. We live our lives at three levels, says Irenka, the conscious mind, the subconscious mind and our Higher Selves. Our consciousness is subjective and judgemental, making decisions and choices, although not necessarily the right ones. The subconscious is not judgemental, but constantly monitors and records everything it sees, hears, and learns, all thoughts, words and experiences, throughout many lifetimes. This may account for déja vu or any puzzling reactions, being your response to memories or events recorded in a previous life. It also explains why you should speak gently and kindly to yourself , and avoid telling yourself you are silly or stupid. Your subconscious will learn and remember that too, but isn’t objective enough to disagree. Interestingly, we seem to keep meeting up with the same people. Your husband or wife in this lifetime, may well have been your brother or sister, mother or father, in a previous one. This also applies to groups such as SDG; Irenka dowsed and asked whether we had met before, and the unequivocal answer was yes, thousands of times! The theory is that this happens because we come to this earth to learn lessons, choosing the lessons we need to learn. If we don’t get things right first time around, we keep coming back, trying to fix things over and over again. This is where the Therapy comes in. A trained and skilled therapist such as Irenka uses dowsing to research past life energies, subconscious blocks, and negative programming of the soul. Using a pendulum, a set of charts and a specific series of questions, discord can be identified and rectified. We heard that thousands of people have been helped by Spiritual Response Therapy, and have gone on to live their lives more freely and joyfully, even becoming reunited with friends or family from whom they had earlier been estranged.